Ahoy! Circumstances all over the place and a packed schedule of festivals has meant that I am on the folk treadmill to returning to writing about the music I love. 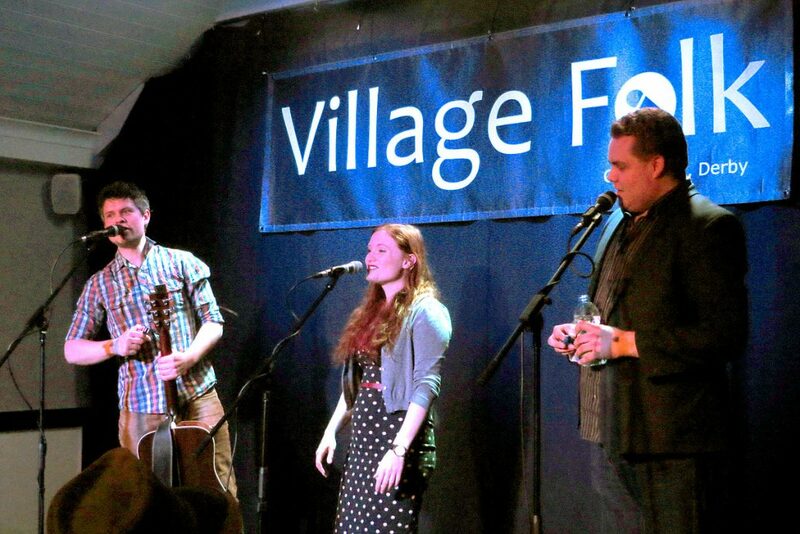 I am not very far along it yet, but one event I wanted to talk about prior to the last festival I attended is the “Dovetail Trio” at Village Folk in Chellaston, Derbyshire. For the sake of the the vast gulf from when I was able to see these lovely people and my report, let me head this post up with “Better Late Than Never”. Some will say 2015 was a good year for folk, others will shake their head in disagreement, and many will probably not remember at all. I admit my memory is like a like a cheese grater where the bits of cheese stuck between the gaps is all I can hope to retain. One thing I am sure of however is that “Wing of Evening” was a a fantastic album with a ferociously collected energy and traditional charm. This album with Leveret’s “In the Round” are two albums that have made me put down the lager and reach for the warm bitter and grudgingly accept that traditional folk is no bad thing. This is not much of an embellishment, after first hearing “Wing of Evening” I went and checked my temperature to be on the safe side.. the only fever I had was “folk fever” (you probably didn’t hear that here first). 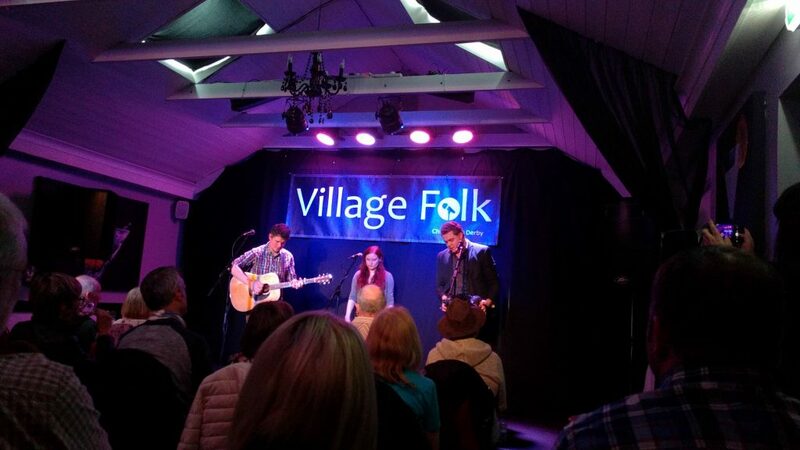 So all-in-all I have wanted to see the Dovetail Trio for a good while, and being here at Village Folk to witness them is a very good place indeed. It continues to be an intimate venue with some great acoustics. For myself it is as good as folk music can be in a small venue as it is a friendly environment without being too harrowing for newcomers, for the casual there are few rules to learn apart from sitting back and listening to some great tunes. On this occasion it isn’t full to the brim, more the pity really for if you haven’t heard of the Dovetail Trio you invariably would have seen the one of the artists in their other great folk projects. Comprising of Jamie Roberts, Rosie Hood and Matt Quinn, “The Dovetail Trio” are a likeable bunch. Young in their years, earnest in their skills and with a focused presence there is little to dislike. Rosie takes lead vocals (for the most part, but not always), with an added guitar (Roberts) and concertina (Quinn) in the mix too. Much like their website they go for simplicity and clarity by playing well-known songs exceptionally well (with some original ones thrown in the mix too). If folk music is like a sack of apples then the Dovetail Trio is the rush of emotion you feel seeing a snake leaping out the bottom of said sack (do snakes eat apples? Please tell). Their set was very good indeed. They play some excellent numbers from the album including the especially tearful and grim “Frozen Girl” (you can probably guess how that track ends), “Poison in a Glass of Wine” and the historical, charismatic “The Rose of York.” It wasn’t all songs from the album though, I particularly notice the rip on the “herring song” (presumably the “octopus song”) which hilariously details the uselessness of the Octopus’ limbs one at a time. The humour is constant throughout the set. If they aren’t discussing the best ways to evaluate pubs (quality of chips apparently, CAMRA should re-evaluate their life goals) then they are putting in their shout out to Robot Wars and the Tree of the Year competition (all fine shows, I did in fact vote for a tree in that competition but not a British one- boo, hiss). They sound great together and seem academically interested in the construction of folk stories as they enjoy telling us the origins and parts of what they perform. There is a lot of zeal for this whole area, particularly from Rosie. They played some personal favourites too, their version of “The Lady and the Soldier” (or “Bold Grenadier”) is a a stark, sweet number with the the soldier of the piece being rather sad about giving up strong beer for wine or whiskey in his travels, but hopefully not the woman he is having his way with away from his “beautiful wife.” The traditional element of “The Dovetail Trio” is really good, Rosie certainly sends up the audacity of the sailor prior to the song and then gives it a care and non-judgemental revelery of the number in performance. The “Oak Tree Carol” was also very good, and crowd favourite “Two Magicians” is as good as ever (and in my opinion one of the best versions of it going). So a very fine gig indeed. How else can I describe The Dovetail Trio? A band with loads to offer. Their reverence for older numbers is matched only by their energy and vigour, imagine Batman’s butler Alfred really polishing the silverware and bringing an immaculate sheen to the household treasures. If anyone can convert a traditional-sceptic it is these guys. I would recommend the album if you have missed it already.. and keep your eyes open, I am sure they will touring again in the near future! If you have missed the album I would recommend getting it, go to Rootbeat Records here or check out other popular stockists! 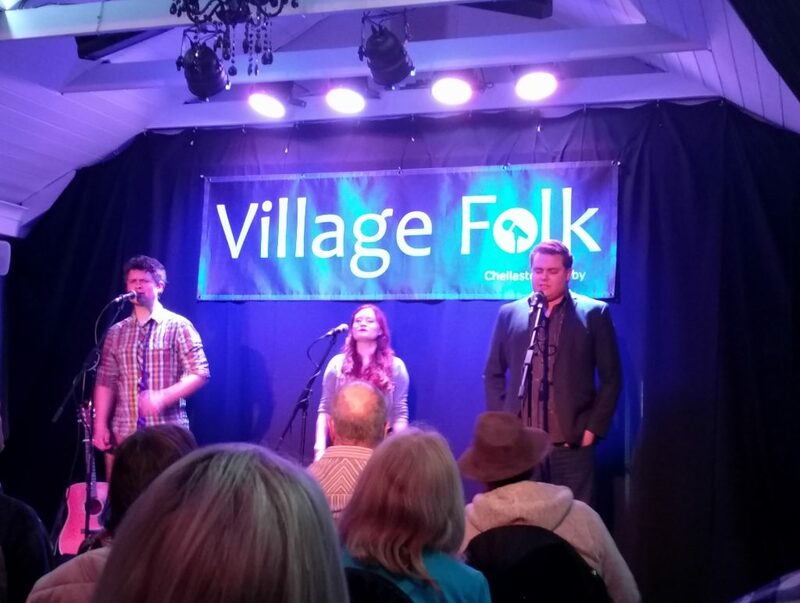 Village Folk are a top bunch, so also check out their website here for upcoming events in particular their upcoming presence at the urban extravaganza that is Derby Folk Festival! (website here).